Leave the M6 at J36 follow signs for Lakes/ Windermere. Take exit off the A591 onto A590 following signs For Barrow. 3 Miles beyond Newby Bridge turn right onto the A5092. At Greenodd turn right onto the A595. Follow this road past Broughton in Furness then turn right at some traffic lights, just before the river Duddon. 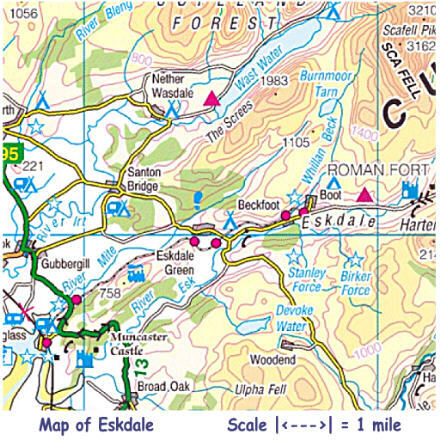 Follow this road to Ulpha, cross the river then take the next left, sign posted for Eskdale. Follow this road across Birker Moor, to the King George IV pub. Turn right and follow the lane to Boot. As above but stay on the A595 at the traffic lights. At Holmrook take a small lane to Irton, take a right turn just before Irton Hall. At a T junction turn right past the Bower House Inn to the King George IV, turn left for Boot. From M6 at J36 follow signs for Ambleside. At Ambleside turn left for Skelwith Bridge 1 mile after the bridge turn right down a small road for Little Langdale take the first left then follow the road towards Wrynose pass traverse the pass and descend to Cockley Beck. Turn right and ascend Hardnott pass this drops steeply down into Eskdale. Follow the road to Boot. This route goes over the steepest passes in England ! Leave the M6 at Carlisle follow signs for Cockermouth on the A595 then for Whitehaven, stay on the A595 until Gosforth then turn left through the village and second right for Eskdale, stay on this road to the King George, turn turn left for Boot.